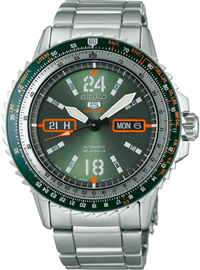 Dial black, green or gray has indexes, which are marked by Arabic numerals and hands, luminous coating. 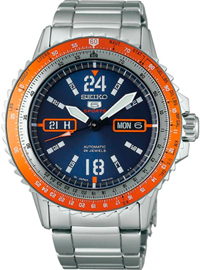 Large aperture date and day of the week is available at the label “3:00.” Mineral crystal protects the dial Hardlex, set screw also on the back cover. Hours SARZ equipped Japanese automatic caliber Seiko 4R36A manufacturing. Mechanism built into 24 stones, has a 40-hour power reserve, Functions: hours, minutes, seconds, day, date. Model complements the stainless steel bracelet with folding clasp.